I now have actual rainfall data for Phuket going back to 1998. A Danish guy called Steen has been measuring the daily rainfall at his house at the south end of Patong for the last 11 years. I am very happy to have found this, and thanks to Steen for sending me the data. Sometime in the next week, I will calculate some real Phuket rainfall averages based on actual measurements over these years. Quick summary of the last few days in Phuket. Friday was again warm and sunny, light winds, very small waves at the beaches. Will July be as dry as June? Saturday started a bit wet. Dark clouds over the hills. Beach? No. But there is always a plan B. We got up late anyway, drove to the Central Festival shopping center just outside Phuket Town, ate in the food court, considered watching a movie, but the next showing of Ice Age 3 was at 2pm... so what to do? Things to do in Phuket when it's a bit wet. Bowling! The Big C shopping center next to Central has the "CS Bowl" 10 pin bowling alley and amazingly we have never been. 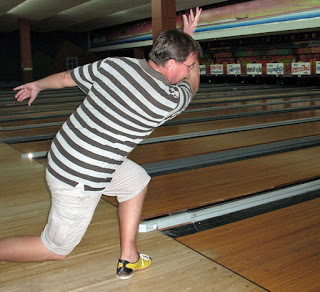 I used to do some bowling when I was a kid, but have not played for about 15 years.. maybe more. The afternoon got sunnier and the evening was warm and dry, good BBQ weather. Today has been wetter, not much sun, rumbles of thunder, the first real un-sunny day for ages, but still there is no monsoon wind blowing. Seas are almost totally calm. Dry again by late afternoon.